In a partnership that aims to fuse ‘the cutting edge of Italian design with world leading racing talent’, Movistar Team – led by Nairo Quintana, Mikel Landa and Alejandro Valverde; and making their debut in 2018, Movistar Women Team, with star riders including Malgorzata Jasinska, Aude Biannic and Rachel Neylan – are powering through the 2018 and 2019 WorldTour wearing a special edition of fi’zi:k‘s top of the range road performance shoe: the Infinito R1 Movistar Team. 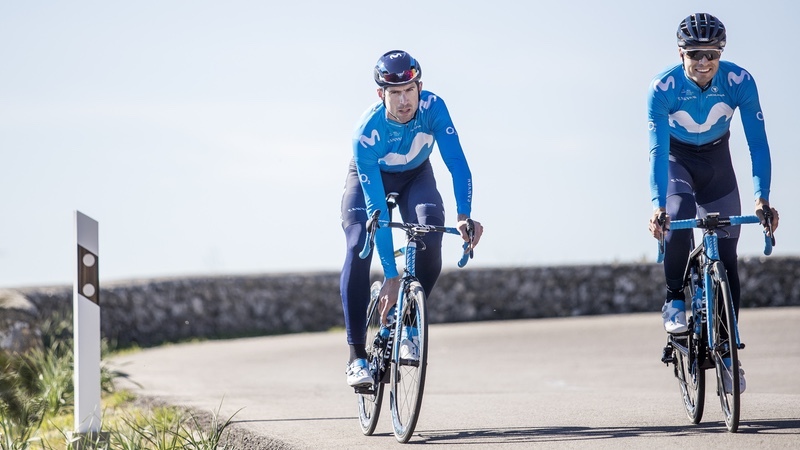 Developed in collaboration with Movistar Team riders themselves and offering up a combination of technologies, materials and improved design, the Infinito R1 Movistar Team aims to encapsulate the very latest in road shoe performance. 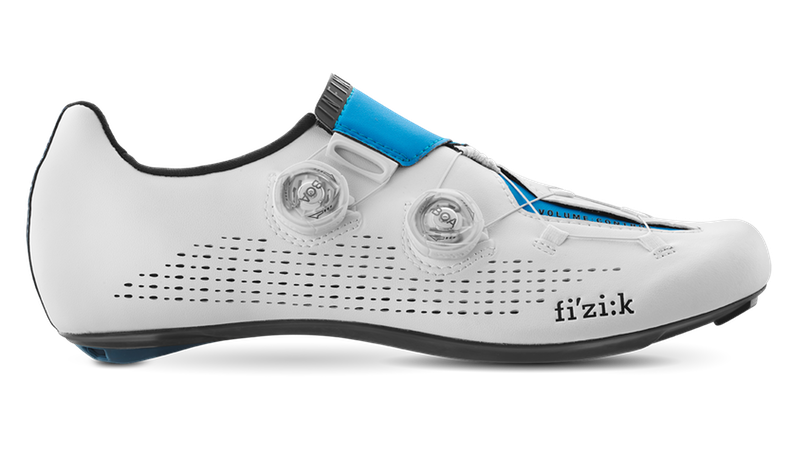 Taking its name from the Infinito Closure System – which uses double Boa IP1-B dials with steel-coated nylon laces threaded in an ‘infinite configuration to enclose the upper forefoot’ – the Infinito R1 Movistar Team delivers micro-adjustability. Working in harmony with the Dynamic Arch Support and Increased Volume Control, fi’zi:k notes that the result is a new dimension of adaptive fit. Fit meets support with the Infinito mesh footbed, which provides structure for enhanced comfort, while careful positioning of textile guides aims to eliminate any pressure on the foot. The full unidirectional carbon fibre outsole is ventilated for temperature control. Engineered for high stiffness and light weight, the UD carbon sole also gives riders ‘the best power transfer possible’. The upper is made with a 1.3mm thick Laser Perforated Microtex for a blend of breathability, delivering strength, flexibility and support. 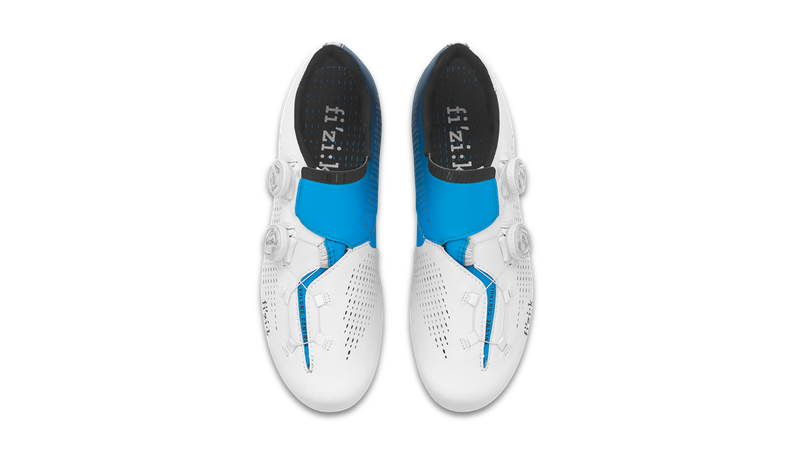 The Infinito R1 Movistar Team shoe is finished in the distinctive Movistar Team colourway, and bears the distinct fi’zi:k logo, embossed vertically on the heel and de-bossed on the upper toe outer.